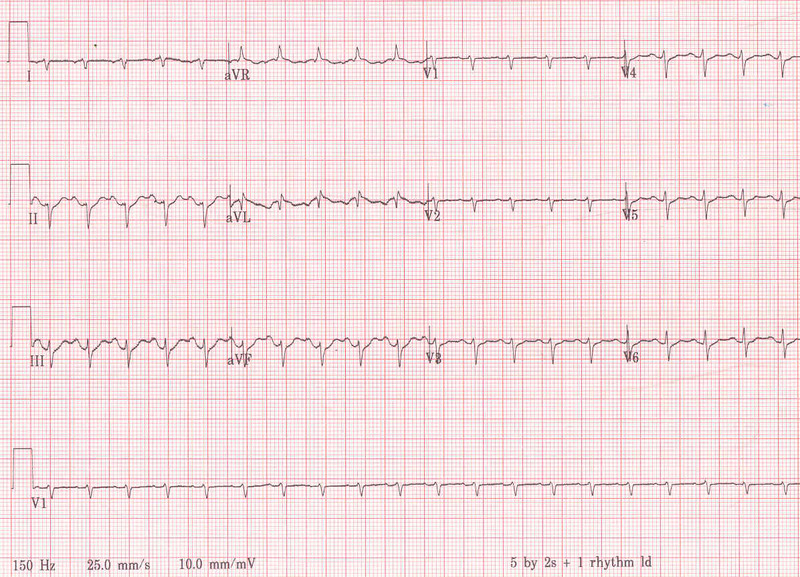 Suboptimal copy, but you get the message! 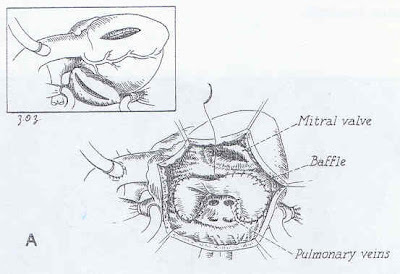 Partial Thrombosis in left atrial appendage, hinders the opening of one of the leaflets - in bileaflet prosthetic valve. 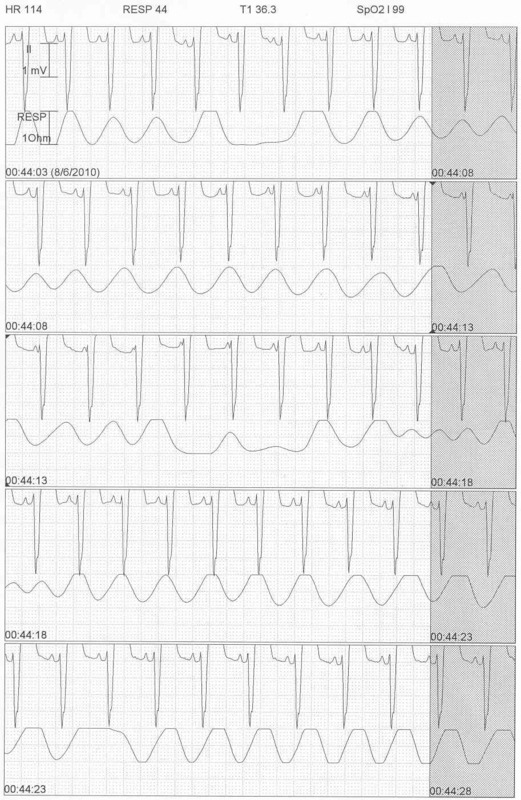 Improves after 72 hrs of thrombolytic therapy. 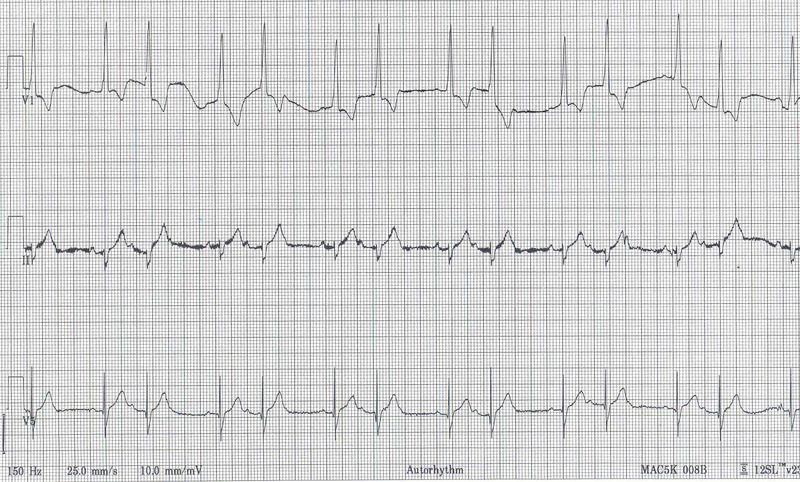 NEJM video in You tube. 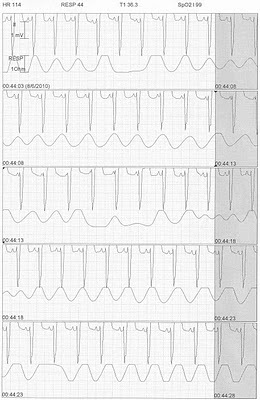 Diagnosis changes once you look at the lower panel. 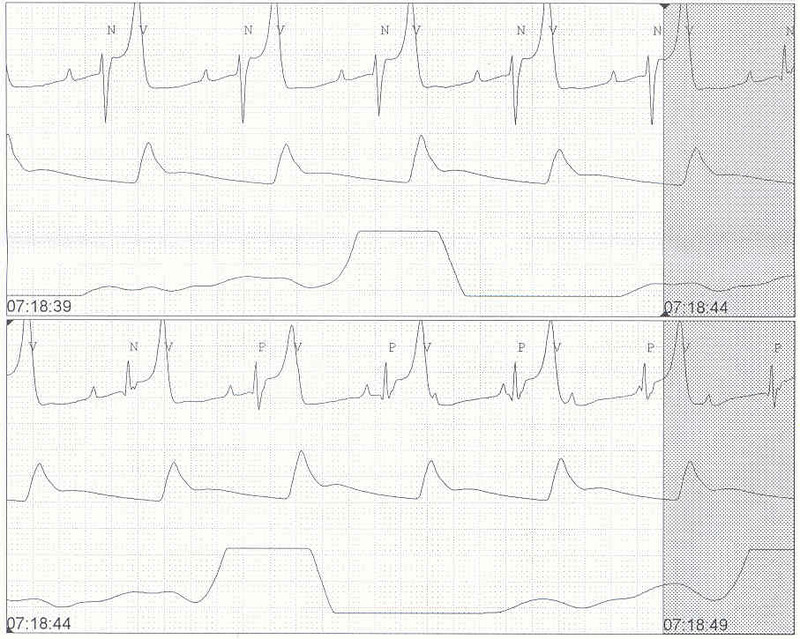 What is the diagnosis for the upper panel? 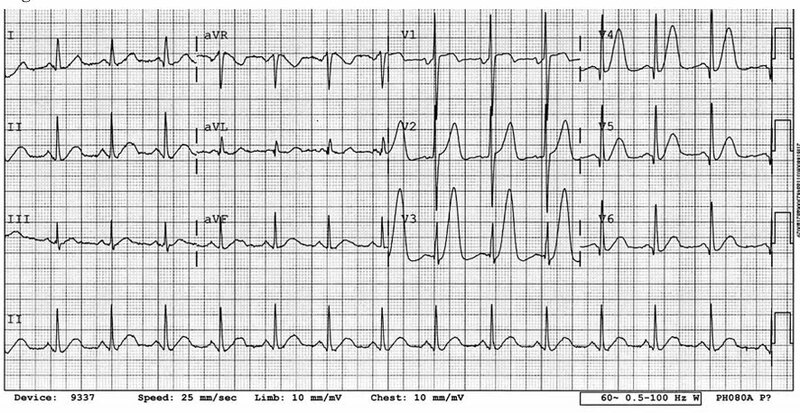 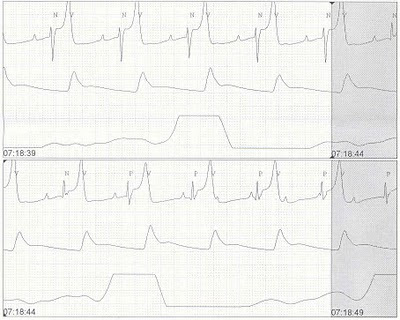 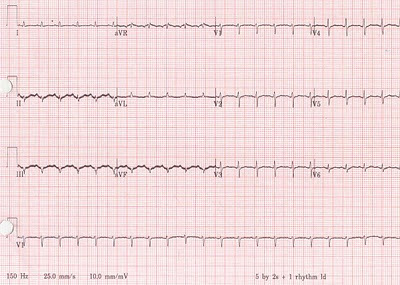 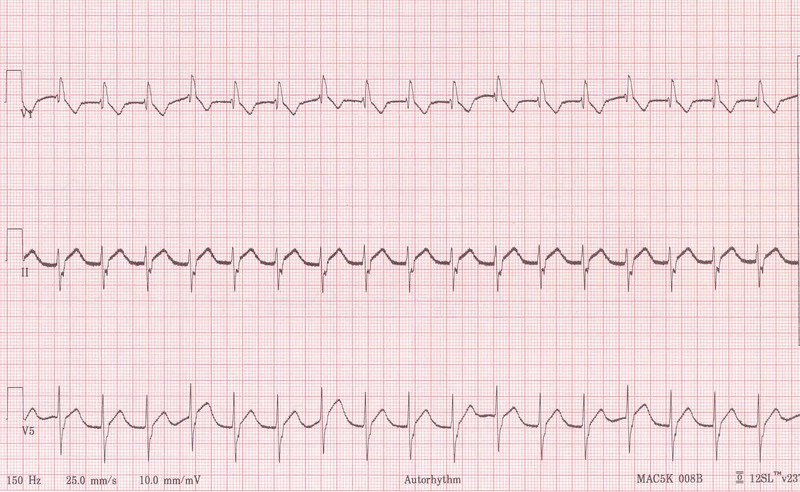 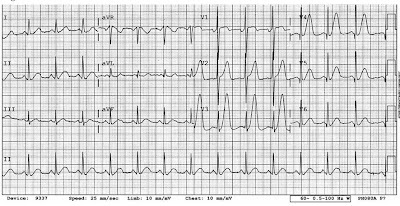 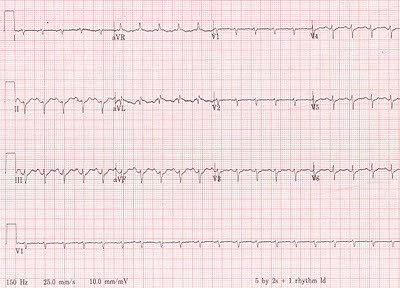 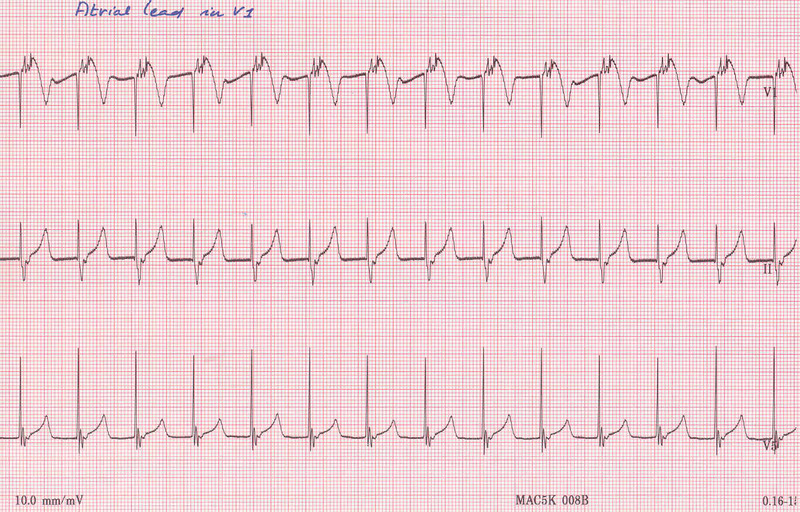 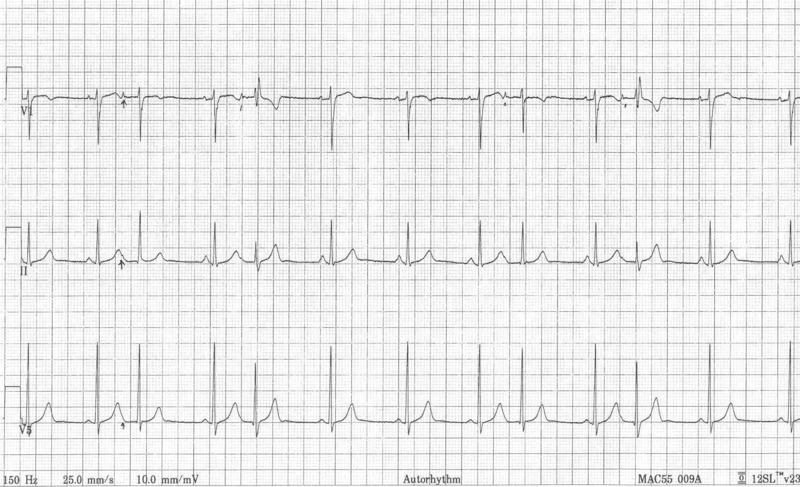 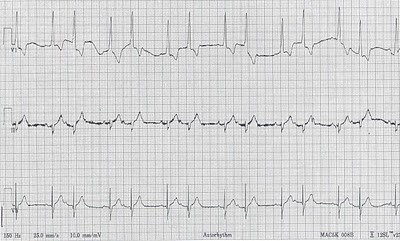 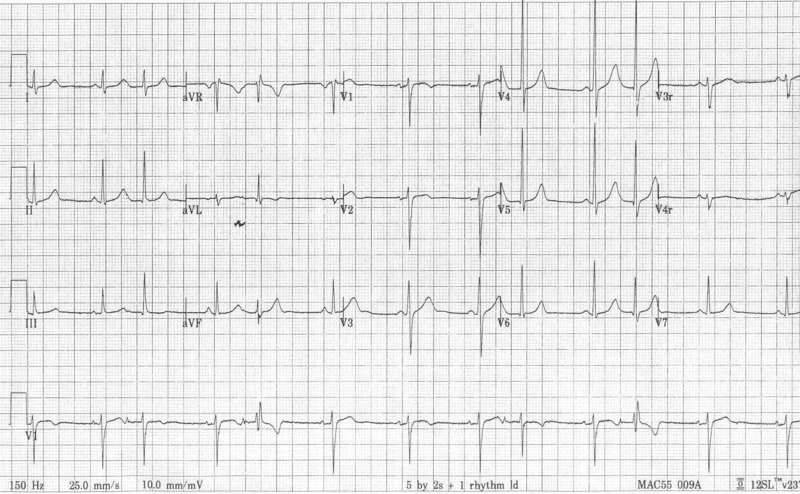 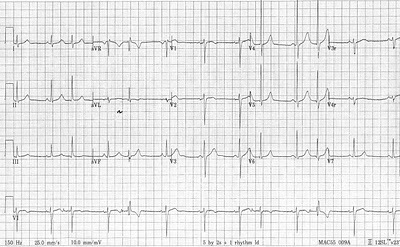 What is the diagnosis for the lower panel? 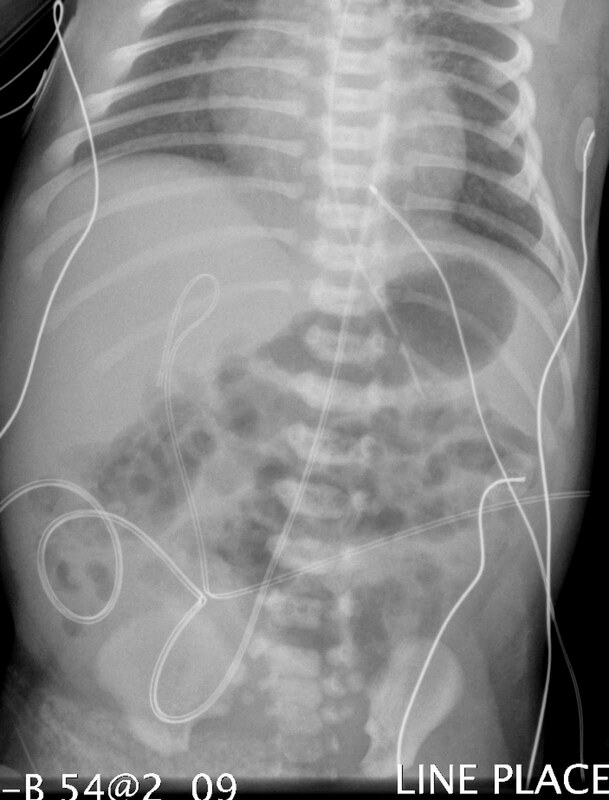 4 week old baby s/p Coil occlusion for Vein of Galen malformation. 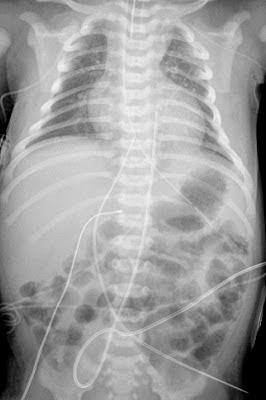 Note: Baby does not have dextrocardia. 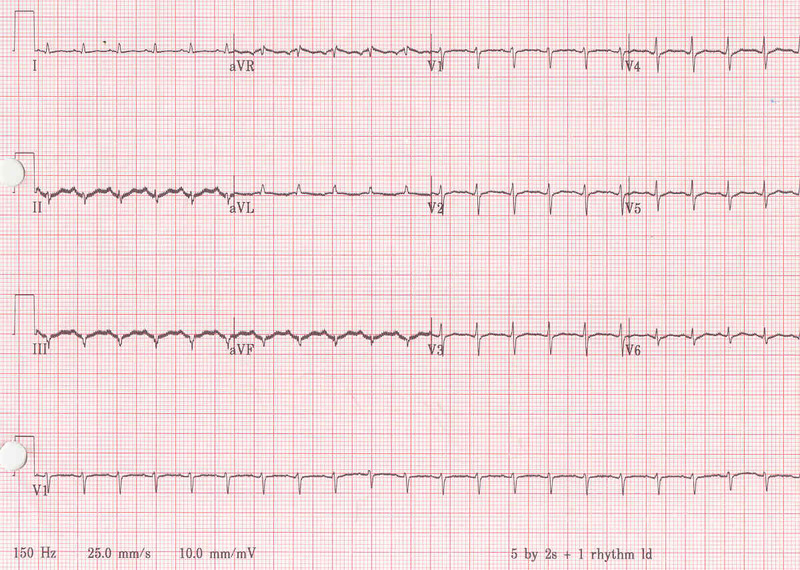 For comparison, this is the baby's earlier EKG at 3 days of age. 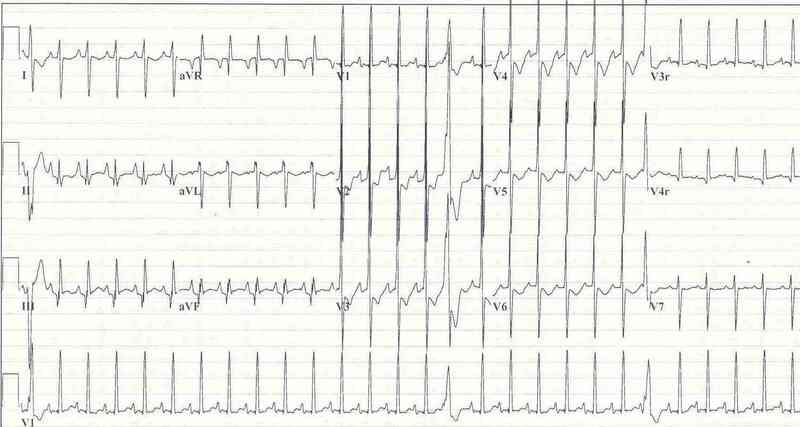 RE-LY trial in patients with Atrial fibrillation. 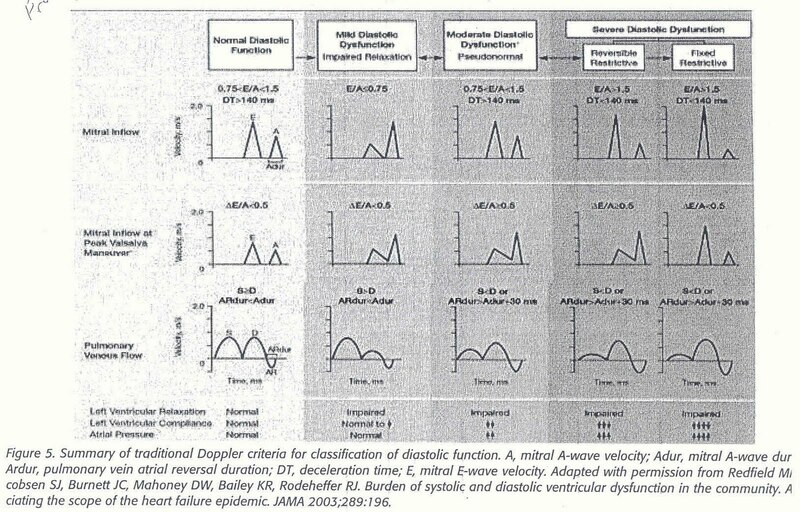 Dabigatran was approved by FDA on 10/20/10. 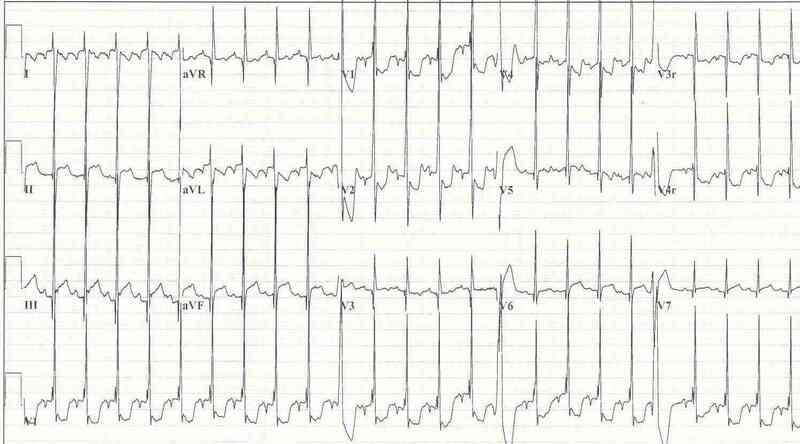 See the posting on Journal Club. 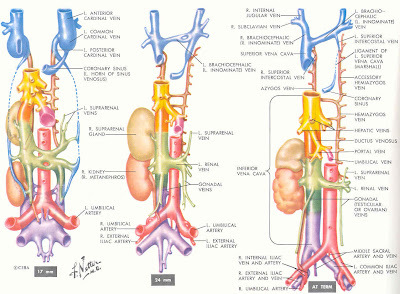 Anti-platelet agents...to be expanded further. 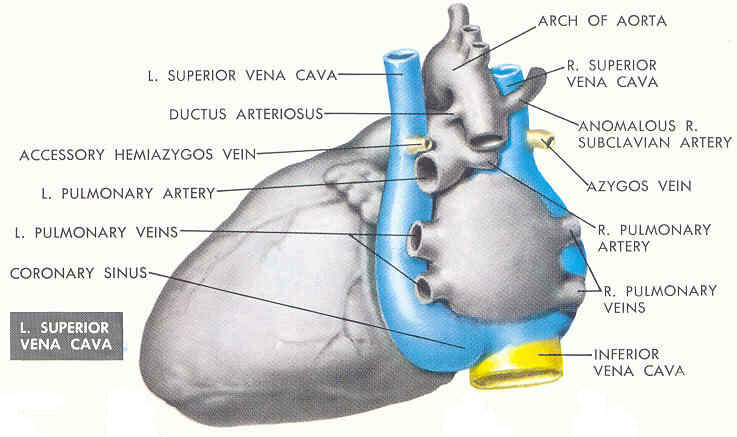 Antiplatelet drugs alter the platelet activation at the site of vascular damage crucial to the development of arterial thrombosis. 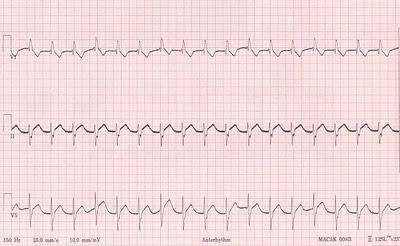 irreversibly inhibits the enzyme COX, resulting in reduced platelet production of TXA2 (thromboxane - powerful vasoconstrictor which lowers cyclic AMP and initiates the platelet release reaction). 2 yr old, postop. 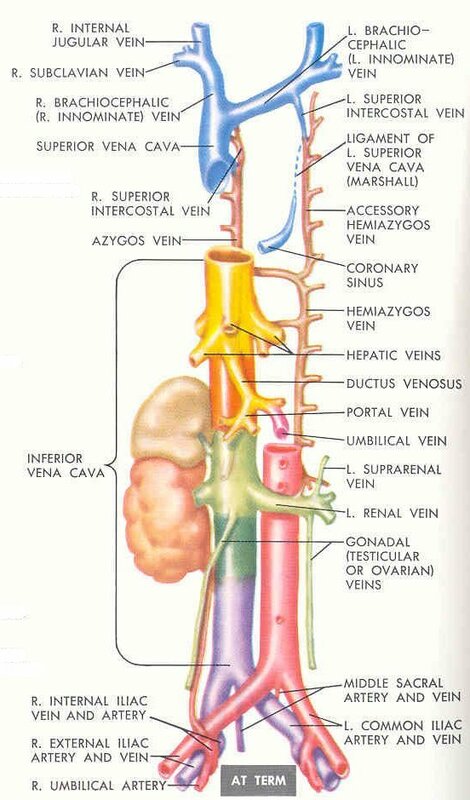 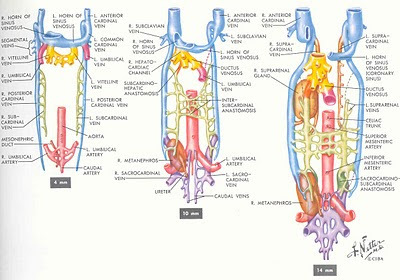 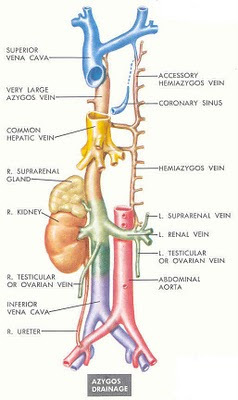 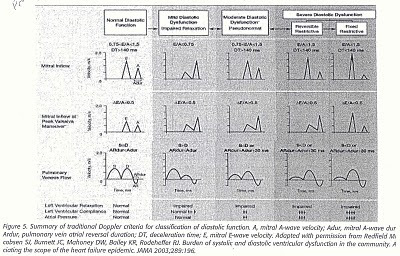 VSD. Returned from operating room 2 hrs ago. 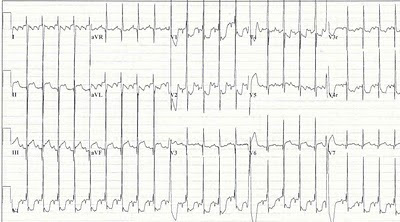 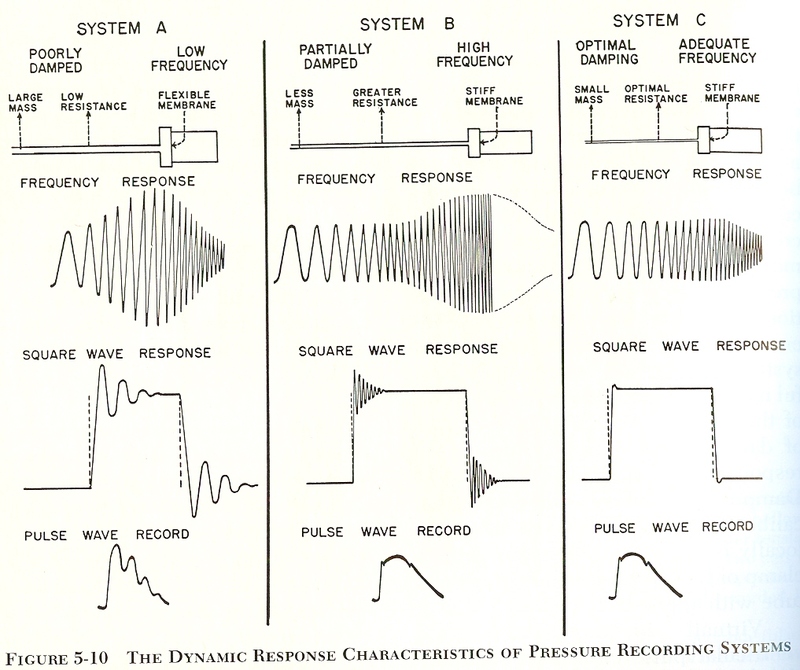 Where are the P waves? 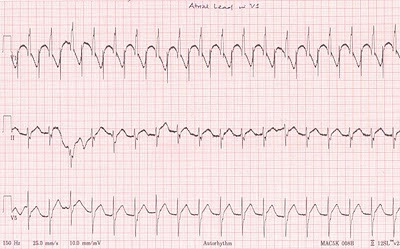 Just a little help to identify P waves: Atrial lead is connected in V1. 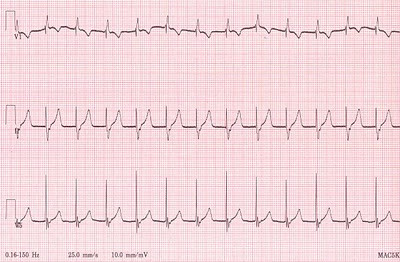 What is happening after the PVC? 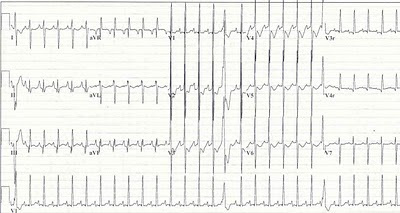 Dr Kyuhyun Wang, Clinical Professor of Medicine, University of Minnesota, Minneapolis, MN. 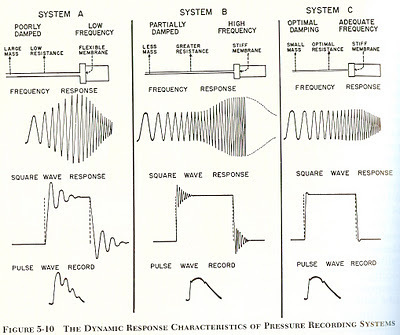 Low voltage complexes. 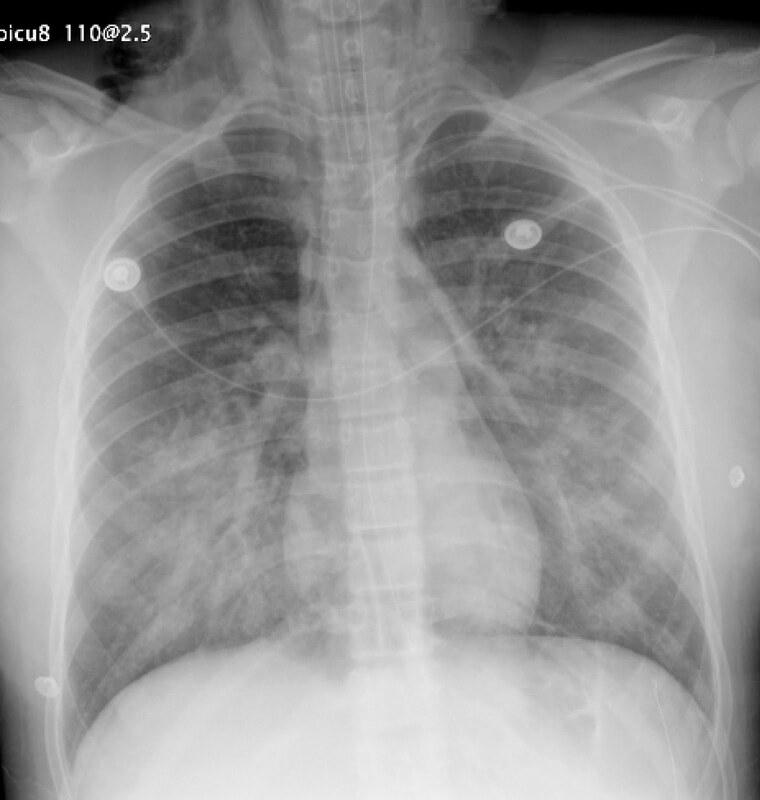 Cause of this is evident in the CXR below. 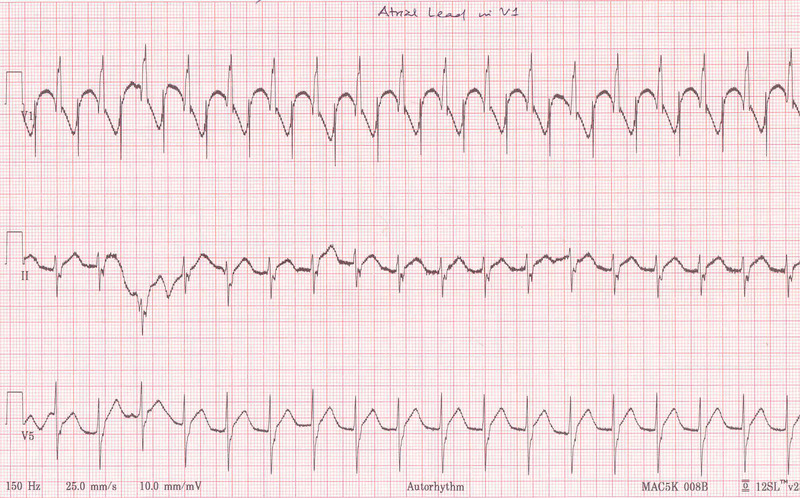 What is the P wave axis? 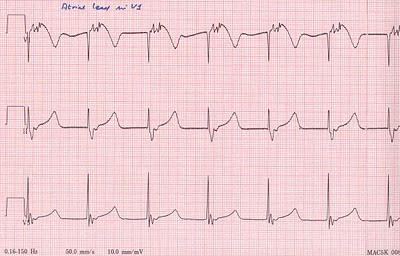 What will be the diagnosis for the unusual P wave axis? 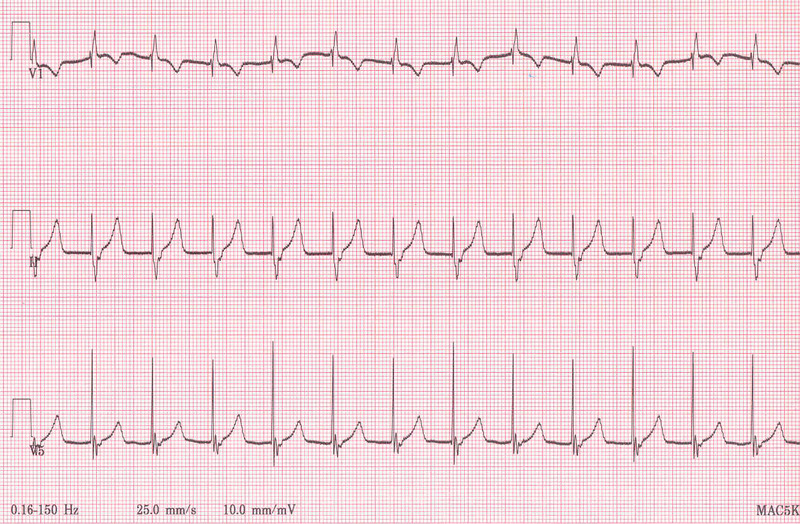 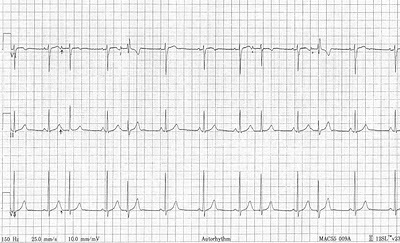 If unusual P wave axis were to be due to misplacement of leads, which leads were misplaced? 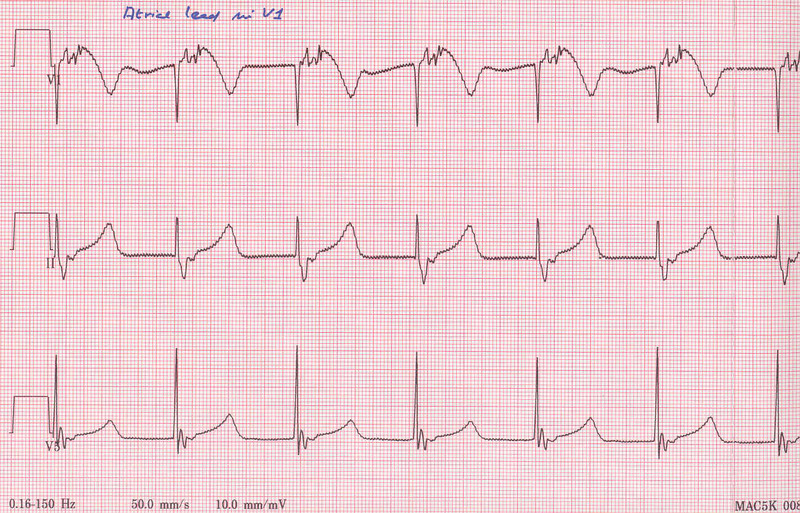 Temporary pacemaker setting: DDD @ 90 bpm. Tip: This is a normal study. 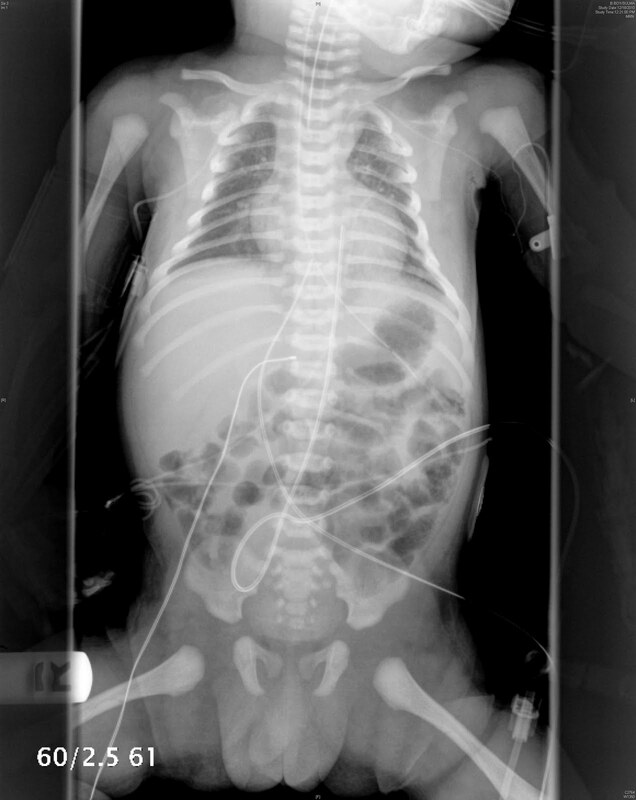 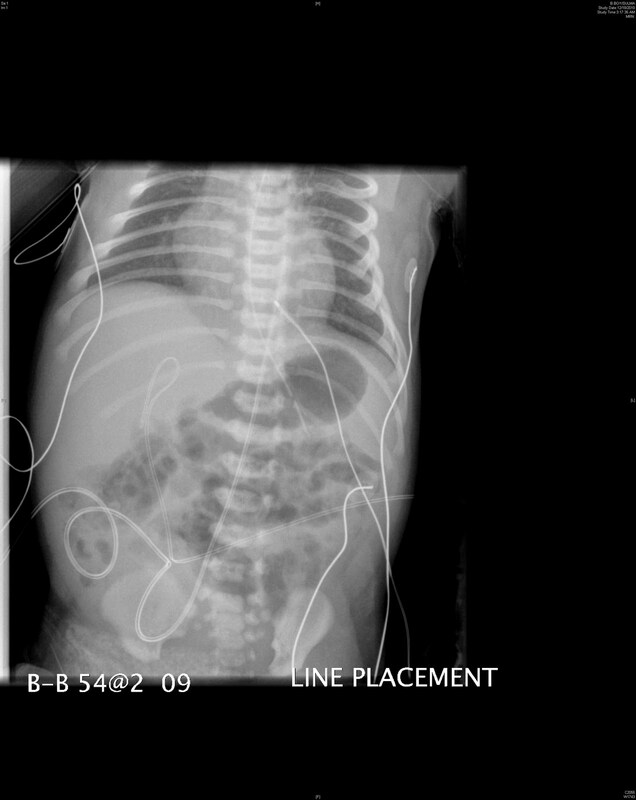 From a Holter recording, in a 3 week old neonate. 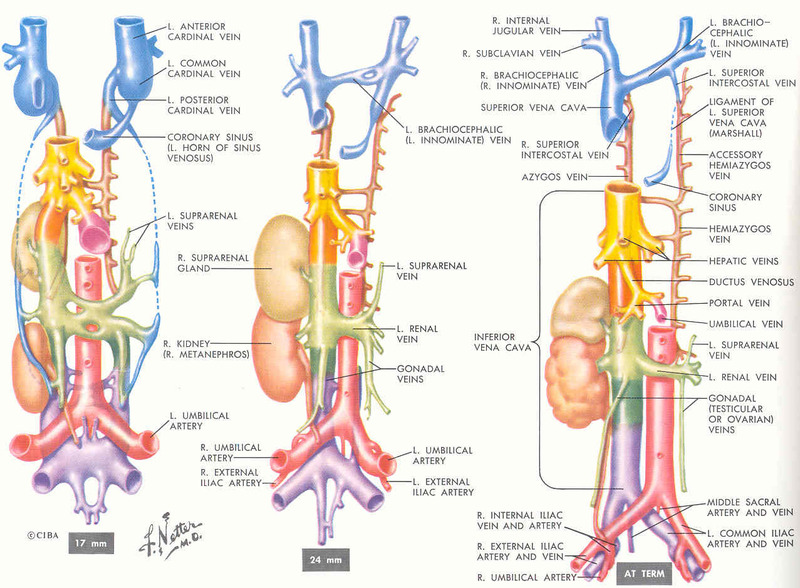 Balaguru D, Artman M, Auslender M. Curr Problems in Pediatrics 2000;30:1-35. 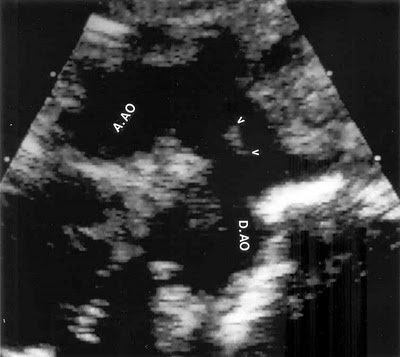 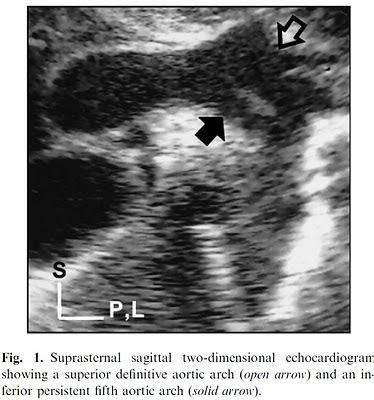 Persistent fifth arch with Coarctation and TOF. 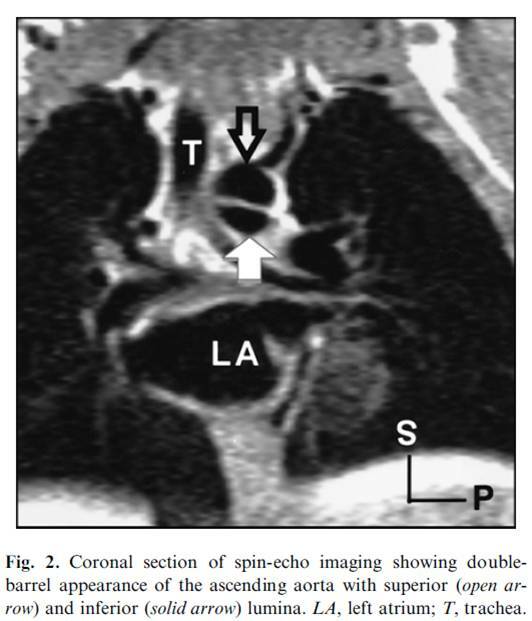 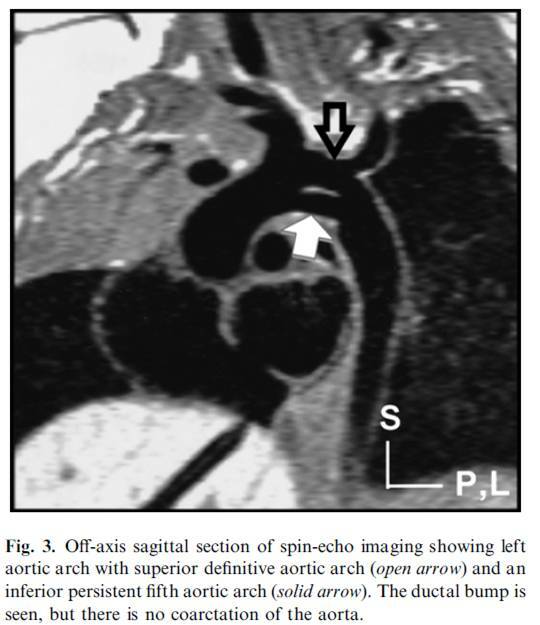 Non-invasive Imaging of Isolated Persistent Fifth Aortic Arch. 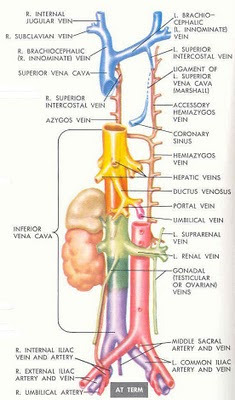 SG Yang, et al. 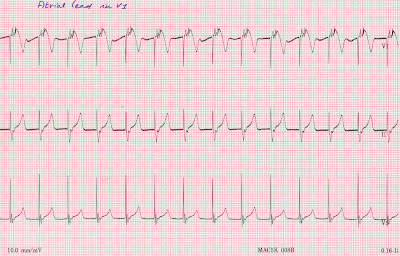 Pediatr Cardiol 2003;24:179-81.